On opening night of the Complexions Fall/Winter season at The Joyce Theater, the audience, comprised with many power players of the dance world, not only buzzes with excitement and anticipation, but also disappointment. We hear that dance royalty, the breathtaking brilliant and talented, Desmond Richardson, is suffering from an injury (received earlier in the afternoon) and is not dancing in this evening’s performance! ….Eee Gads …Say it ain’t so! Like many audience members, I question if Complexions’ performance will possess the same virility with the absence of Richardson. The curtain rises, and any doubt in the room dissipates with an exploding big bang as Dwight Rhoden’s Moon Over Jupiter takes shape over Rachmaniov’s score. A meteor shower of momentum and dynamics, the ballet showcases the extreme unique talent and technique of all the Complexion dancers. Like an orbiting solar system, the dancers move in organized chaos into an eclipse of synchronization. Metallic, spider webbed leotards and shorts expose the dancer’s thoroughbred, horse-like muscularity, direct proof that these dancers are pushing their physical means. Clifford Williams, the shooting star of the ballet, demands attention with phenomenal extension and effortless fluidity of movement that only the trained eye would understand the extreme complexity and challenge of the choreography. On Holiday opens part duex of the evening and relies on the show business aspect of dance. Slightly reminiscent of Twyla Tharp’s Nine Sinatra Songs, On Holiday is danced by four couples expressing four stages of love. Each couple embodies the lyrics of Billie Holiday, but Christina Dooling and Edgar Anido really transport the audience to a Love-Hate relationship. Intensity and heartache emanate through the audience as Doling and Amide manipulate each other to provide a heart wrenching performance. Originally, to follow On Holliday, is Richardson to dance A Goldberg Variation, but instead, Christie Partelow and Mark Caserta dance Rhoden ‘s Spill. Entering with abandonment in a grand jete lift, Partelow and Caserta leave you with no regret from missing Richardson’s performance. In complete unison, they dance in a continuous stream of intricate and exhilarating partnering. Like riding a rollercoaster of constant excitement and unexpected turns, Rhoden’s Choreography escapes all predictability confirming his much revered status in the realm of today’s contemporary choreographers. A fun and lively Moody Booty Blues is like the after hours employee dance scene in “Dirty Dancing” where Baby meet Patrick Swayze for the first time. The dancers dance fearlessly with grounded movement and soulful rhythm. Moody Booty Blues showcases the young talent of Complexions; Gary W. Jeter II sets a very high bar with his opening solo of insane syncopations and intricate isolations and Peter Chursin and Stefano DeMartino match Jeter’s energy. Chursin is especially captivating with his flawless technique and exquisite lines. After grabbing my attention, I couldn’t stop watching Chursin in the finale piece Rise. Rise, which Rhoden choreographed to various songs by U2, opens with the song “The Streets Have No Name” and one man running in the spotlight. High impact choreography plus Bono and the Edge guarantee an awesome performance. I have seen U2 live in concert several times, and the Complexions Dancers even give Bono some competition. Complexion dancers are a dynamic breed of physicality that is unparallel to most contemporary and ballet companies. The dancers elevate the choreography and provide a powerful performance of non-stop impressive feats. 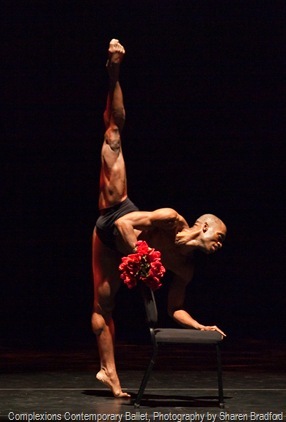 Complexions Fall/Winter season continues to run through November 28th at the Joyce Theater.